Sourdough and Other Stories by Angela Slatter has been on my radar for ages, but somehow I’ve just never got around to reading it. For a while I didn’t realise it was available as an ebook – and Tartarus Press does lovely hard copies, but they’re a leedle expensive for a book you’re taking a chance on. And I also wasn’t sure that these stories were ones that I would really connect with. 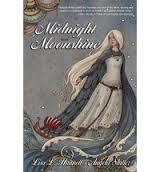 I mean, yes, I loved “Brisneyland by Night” in Sprawl, and a few others Slatter has written – especially with Lisa L Hannett – and Midnight and Moonshine made me cry with its beauty, but… I just wasn’t sure. And then I found out that Slatter had a set of ‘prequel’ type stories coming out, so I thought I should read those first. Halfway through reading The Bitterwood Bible and Other Recountings, I finally bought myself Sourdough because there is no way I can now not read that collection. 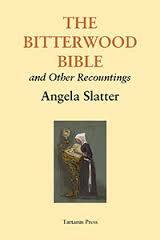 Because I am absolutely an Angela Slatter convert. The stories collected here are not quite a mosaic in the same way that Midnight and Moonshine are. There, each story was clearly connected – most often by family, which made it seem a generational saga. Here, while there are a couple of stories that feature the same protagonist, a few more with recurring cameos, and most set in the same place or with the same background characters, it’s more like a series of stories set in a couple of distinct suburbs or small towns. Of course you’re going to get the same bars, or neighbourhood characters, or landmarks mentioned; that just makes sense. But the narratives themselves aren’t necessarily connected… although sometimes they are. And these locales that Slatter has invented are very believable. They’re well-realised, and they’re familiar in that fairy-tale sort of way. Because these are indeed a sort of fairy tale. There’s not a whole lot of magic; what there is is generally a quiet, dare I say domestic without it being in the slightest derogatory, magic; no flashiness or gaudiness here, no winning of wars. That would draw too much attention, and drawing attention in these stories is generally A Bad Thing. The women – and the protagonists are almost all women – mostly want to be left alone, to get on with their lives. Sometimes they’re forced to interact with the world, or with other people, that they’d rather not; because they need to achieve some specific goal, or because they’re being manipulated, or they otherwise have no choice. But you certainly get the feeling that most of them would just prefer never to be in the limelight, not to be a household name… not to stand out. There are scribes and poisoners, seamstresses and pirates, teachers and coffin-makers and servants. They are mothers and daughters and child-free and orphan, young and old and neither; rural and urban, rich and poor. They have varying degrees of agency and control, varying chances of living after and of living happily ever after. This is a wonderful collection of stories. They can and should be read and enjoyed separately; they can and should be read and enjoyed together, making a whole even greater than its parts. Oh, and Kathleen Jennings’ lovely little illustrations throughout are a delightful addition; I imagine they’re even more impressive in print, but electronically they’re still fine. This review is part of the Australian Women’s Writers 2014 challenge. It’s the exacting details in this book that means it has dated so dreadfully that for all it’s an interesting enough story, I just can’t imagine anyone born after about 1980 enjoying it. Except possibly for its historical value. There are two plots entwined here: a ghost story, and a technology story. And they’re packaged with a family drama, just to give the main character another headache. The ghost story aspect holds up, as one would expect, in that it’s not context-reliant; you could have the same story set in 1850 or 2050. Syb’s new house is always cold, and the new housekeeper Hille starts talking spooky things as soon as she moves in. 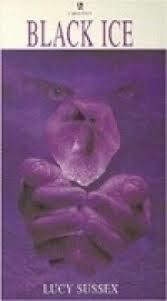 Hille wears an amethyst and claims to see ghosts, or spirits, all over the place. Syb is dubious, but…. The technology aspect, though – oh, I giggled. This was published in 1997. Syb is really lucky because she has an email address and can dial up the internet with her modem any time she likes. She wins a competition and gets an internet camera. People are able to get hold of each other’s email addresses quite easily, there’s only a few websites to search for on any one topic, and hacking is a breeze. I have no doubt that Sussex was going for close-to-bleeding-edge experience with this story, and going for serious verisimilitude with the intricate details. But all of that means that it really hasn’t travelled well. Which is a shame, because Sussex does write well and engagingly. The inside cover calls it a Children’s Book; it’s what I would consider the younger end of YA. Syb’s parents are going through a rough patch, and this is dealt with brusquely but (and?) sensibly. It’s a “this is not the end of the world” attitude, but not “this doesn’t matter.” Intriguingly given how many such novels get rid of the parents completely, Sussex does it a bit differently: the mum goes away but stays in contact via email; the dad is always a bit absent in his attitude but is always present and still relevant. Also, the romance interests are just barely present but more usually as an irritant than anything else. This book was read as part of my read-all-the-books-I-own-but-haven’t-read effort, and conveniently also contributes to the Australian Women Writers challenge for 2014.